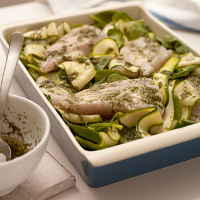 Mix the spinach and courgettes, spread on a baking tray and top with the pollock fillets. Whisk the garlic, dill, lemon zest and juice into the oil. Season well and drizzle over the fish and vegetables. Bake for up to 14 minutes, until the fish is cooked through and the spinach is wilted. Smaller fillets may take less time so check regularly. Serve with rice.